The content of this page is based on Prison Architect Version 1.1. The information shown in this Article covers a feature that has recently been updated. As a result, some if not all information in this Article may be incorrect. This Article would benefit from the Addition of one or more Images. Be a Prisoner and try to escape. A hard fight against some guards. Besides from building and managing prisons, there is another game mode in Prison Architect: The Escape Mode, where you are a prisoner yourself and have to try to escape from the prison. The Escape Mode will automatically start if you met the failure condition of allowing too many deaths in a short period of time. You will then be convicted of Criminal Negligence, and will spend time within your own prison as a prisoner. The Escape Mode can also be started from the menu directly, where you can load any save game to start playing there as a prisoner. As a prisoner, you are able to walk around in the prison, obtain contraband items and dig tunnels from your cell. By causing trouble (e.g. damaging furniture, fighting guards), you will build up reputation points, with which you can gather reputations (like "strong", "tough", etc.) or improve existing ones (e.g. to be "extremely tough"). You can use the reputation points to recruit other prisoners to follow you around, and to gather reputations for them. Prisoners in your crew can help you to dig your tunnel and causing trouble. If your own character is knocked unconscious, you can play on with other prisoners in your crew. If you see handcuffs on your prisoner, that explains why you can't pick up anything or leave the prison area. You can move around with the WASD or the arrow keys. Most other actions are performed using the mouse. See Controls for more information. Obtaining the reputations in their basic level does cost you one point, increasing them to their "extreme" level is five reputation points. You can also use the reputation points to recruit other prisoners to your team, or to build up reputations for existing members of your team (for the same price). Recruiting the first squad member is one reputation point, the second two and so on. Prisoners that already have reputations are more expensive to recruit. Also, you can skip punishments by spending one reputation point (see Skipping time). Whenever you are in a room containing contraband, you can wander around in order to find some. When a contraband icon is displayed, you can hold the right mouse button for some seconds to steal it. You can carry two contraband items at once. They are then displayed in your inventory at the bottom of the screen together with their properties (e.g. attack power). Clicking one of the items there will equip it, to use it as a weapon or tool. You can also drop them. When in any cell, you can stash your contraband items to avoid getting caught with them. In your own cell, you can start digging a tunnel starting from the toilet. Digging tools will wear out when doing so, so you will need to get new ones from time to time. If you steal an item from a room, there is a three hour timer before that item can be stolen again from that room. These timers end instantly when the player surrenders or is knocked out. After you have recruited other prisoners to your squad, they will follow you where you go, unless you or they are punished, unconscious or dead. You can also click their name on their icon in the upper left of the screen to toggle whether they should follow you or do their own thing. By clicking on their face, you can switch which prisoner you want to control actively. A quick way to switch between controlling squad members is by pressing "q". One can order all squad members to stop what they're doing and follow them by pressing "r". By clicking the "x" in the upper right corner of each prisoner's picture, you can remove him from your squad. When you are being punished (i.e. in solitary or locked in your cell), you can skip this punishment via the according button in the upper left of the screen. This will cost you a reputation point. Once you've recruited squad members, you can switch to playing as another squad member while one member is being punished. When you are in your cell during the night time, you can skip the night by pressing the "Sleep" button in the upper left of the screen. This won't cost you anything. At any time, you can use the time controls in the upper right of the screen to pause the game or play at double or 5x speed. If you just want to get somewhere faster, you can hold the Shift key to run for a short while. This requires you to have the "Quick" reputation. As a prisoner, you are not allowed to enter any zones which are marked as staff-only or that are designated for another security level than you are. Trying to do so will be counted as an escape attempt and the guards will come after you. However, you are usually not required to follow any regime. Except for the sleep and lockup regimes, you are always allowed to wander around freely. When caught outside your cell by a guard during these regimes, you might be brought back there (but not punished) by a guard. The game is finished when you either manage to escape from the prison (with your whole squad), or if the entire squad dies. A "Game Over" screen giving you a score and some statistics is presented in both cases. See Winning and Failure Conditions for more information also on how to win or fail in other game modes. 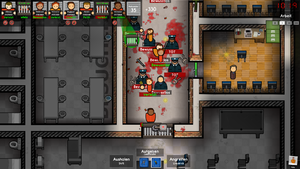 Once the player surrenders or is knocked out, damage done to a prison and its staff is repaired automatically. All staff killed are replaced with new hires. All fires are extinguished, and burnt down walls get construction jobs created to replace them. An easy way to gain reputation points, is to walk around and punch some furniture by left clicking on it. One hit is enough, then you can continue to the next object. Wait until guards try to kill you before surrendering. Keys are a godsend - if you see other prisoners get into a fight and take down a few guards, steal the keys and stash them in your cell. You should now already have a couple of reputation points to spend. Invest one point in each attribute. Next, you should search the kitchen, grab a knife and stab as many people as possible. And again, surrender before the guards kill you. Skip the punishment, hire a squad with three to five prisoners, invest your points into every ability of the squad members and start a fight in the shower or canteen against other prisoners. With the deadly reputation, your squad will be able to kill many prisoners, employees or guards. With the gained reputation points, you should hire even more prisoners. Try not to kill prisoners - ideally, one should only kill guards (including K9 units and armed guards) and emergency crews. If you want to start a riot, don't melee other prisoners with one-hit-kill weapons like hammers or axes. Prisoners don't replenish as quickly as prison staff. The last part is to find a place where useful weapons can be found. An armory would be best, as a shotgun is very powerful and has unlimited ammunition*. In case such a place is well guarded, you might consider taking tools and weapons out of a workshop, kitchen or infirmary. With a squad of five to seven prisoners, it will be pretty easy to simply walk through the main entrance of the prison, as you kill guards faster than they do. As of Version 1.1, shotguns, like some other guns, have only 6 shots. This method is brutal yet pretty easy as long as the prison does not have an extreme amount of (armed) guards. If you can only afford 2 reputations, get "Tough" and "Quick". It truly pays off to not die after being shot or bludgeoned once. Being quick makes melee combat much easier - you can strike at your target then keep retreating when they strike back at you. This page was last edited on 23 October 2017, at 08:41.